This 84" Concrete Memorial Park bench can be made with a logo on the back. Memorial benches are beautiful for cities & parks. Engraved benches carry your custom lettering and artwork. Perfect for your donor recognition project. 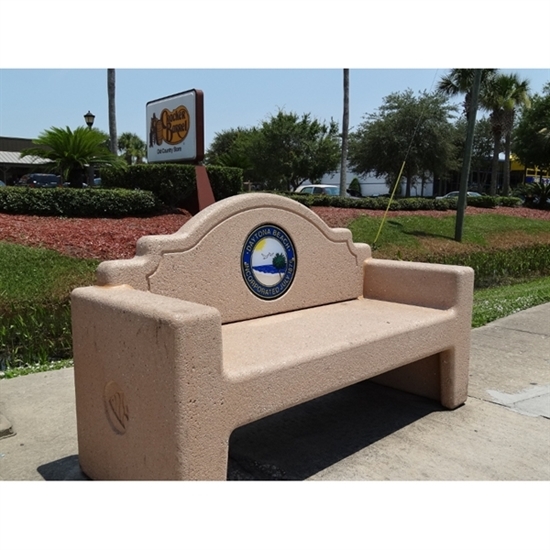 Made of precast concrete reinforced with full steel rebar caging for strength & durability. High quality, low maintenance concrete construction will hold up to vandalism, theft & all climates. May be customized with cast-in-place or silk-screened logos. Engraving is epoxy filled. No Assembly Required. Lift gate service included.